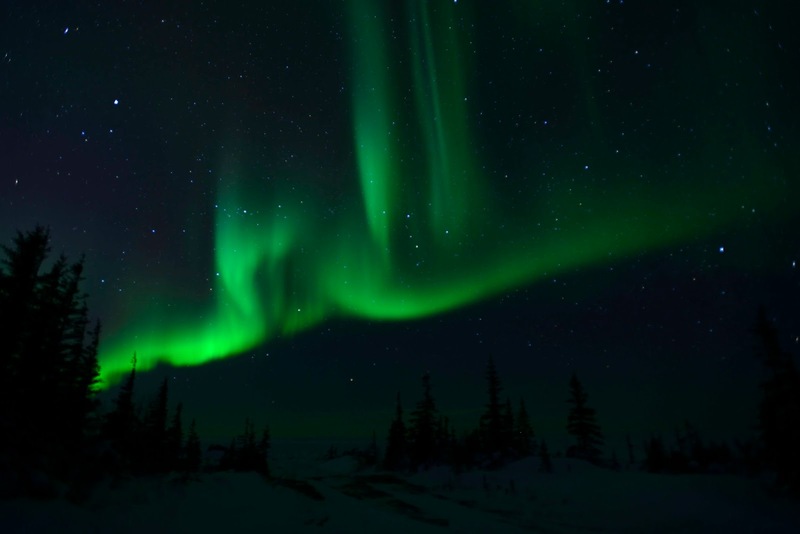 As many of you know, Jan and I recently embarked on a nearly two-week vacation with the primary purpose of enjoying ourselves in new territory and experiencing the aurora borealis. The pictures decorating this blog are ones I took on this trip. Neither of us had ever been to Churchill, Manitoba or anywhere on Hudson’s Bay, and we enjoyed the two-day train ride up from Winnipeg. Jan had never seen the northern lights, but I had seen them on several occasions in the vicinity of our camp in Michigan’s Upper Peninsula. The most recent had been more than a decade ago. I had stood on a low hill in a clearcut (now filled with twenty-five-foot larch) with open northerly views and watched a shimmering of greens appear with a fleck here and there of red or purple. Each time I had seen them, I had prior notice because the experts had detected a major solar event that they expected would trigger excellent displays. 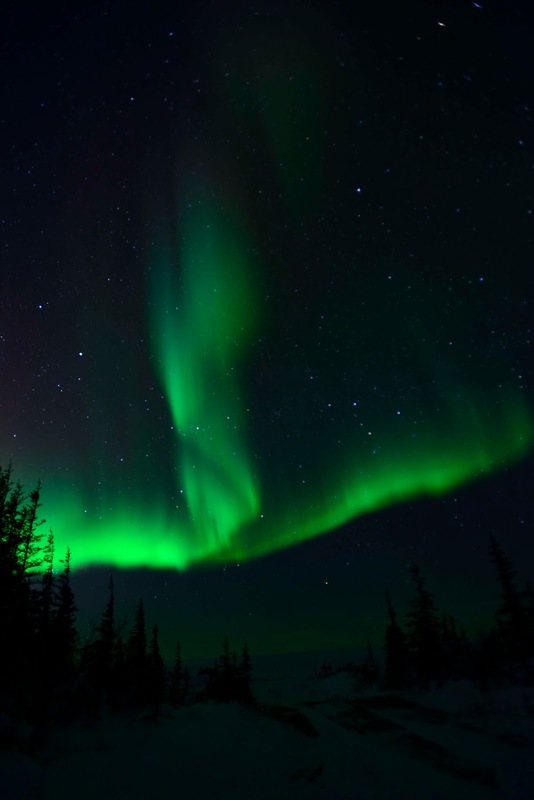 It turns out those northern light views I experienced were akin to the blast of newfound love: brilliant, colorful, shimmering in excitement, leaving me breathless and a bit dizzy. What I came to realize on this trip is that, unless one is exposed to a major solar occurrence or one has prepared themselves to see the colors, we witness the more typical aurora borealis (in its long-term love affair with earth’s magnetic field) as silver. 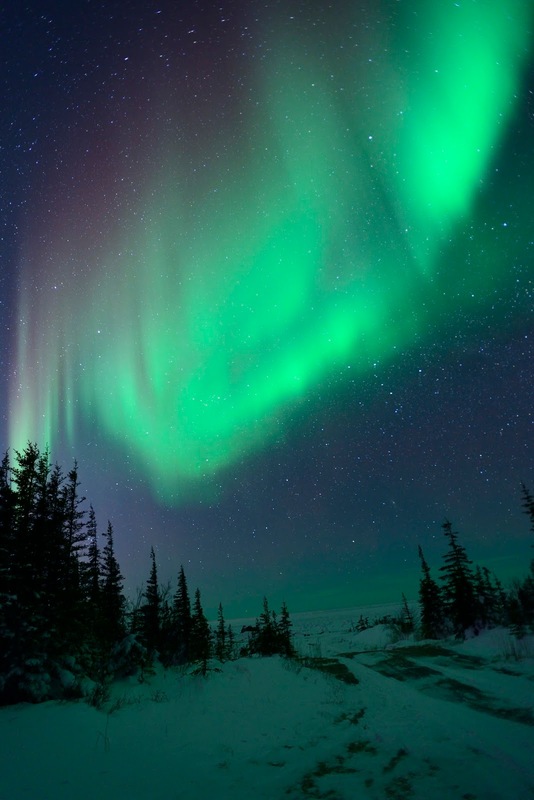 Our visual hardware causes us problems in our quest of magnificent colors in auroras. Our eyes have two sensors, rods and cones. In a simple model of sight, rods allow us to see in low light levels. Cones are effective in brighter light. Rods do not provide color vision. Cones come in three flavors and generate electrical currents that allow our brains to “see” color. That’s the problem: at night, we have low light. That requires rods and yields no color. To get our cones involved and generate color, the light must be brighter—or we need to have sensitized our eyes to the darkness. For the impatient among us who would like to rush out from our well-lit houses to see the aurora, our cones have no chance to acclimate. As an example, think of what happens when we rush in from the brilliant sunlight of the beach and enter the dark of the men’s or ladies’ room. We can’t see a thing. Our cones are still stimulated from the sun bouncing off sand and water, and all we see is a smear of white. Our rods are still on break, off smoking a cigarette or chatting up the lovelies at the concession stand because, as far as they knew, there was nothing for them to do. My few experiences with northern lights in Michigan had been on evenings when the lights were bright and my cones were able to paint the scene in color. Our first night in Churchill, we had a very nice display—and for me (and everyone else) it was all white. After that experience, I now believe many of the times I went out to look at northern lights in Michigan and believed I had not seen them, I had in fact witnessed the display without realizing it. I thought I saw only patterns of high cirrus clouds and did not recognize them for what they were. 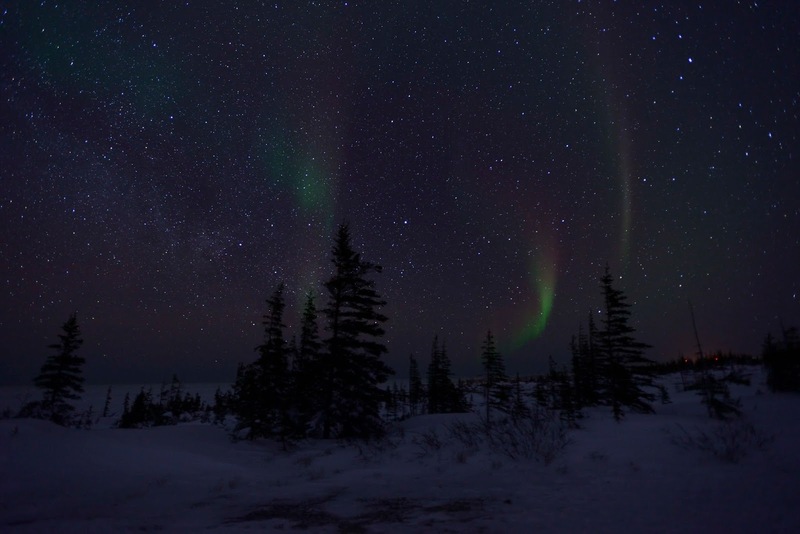 On our second night in Churchill, Jan and I were two of only four in our group of twelve who stayed up late enough to witness the northern lights. Around 12:30 a.m. this aurora borealis started very softly, but soon built into a rollicking dance of light, some of which was bright enough (and I had been outside for over an hour) that I once again saw patterns of dancing greens. That aurora spanned the heavens with an arc I’d estimate at almost 1200, and reached high into the sky. It was so massive that even with my 17mm lens, I could not catch it all in one photograph. The third night it snowed. The aurora may have been burning bright, but we weren’t about to see it. Having been up two nights in a row until after two in the morning, I took it as a sign that I had nurtured my soul the previous evenings and that going to bed early was appropriate to nurture my body. 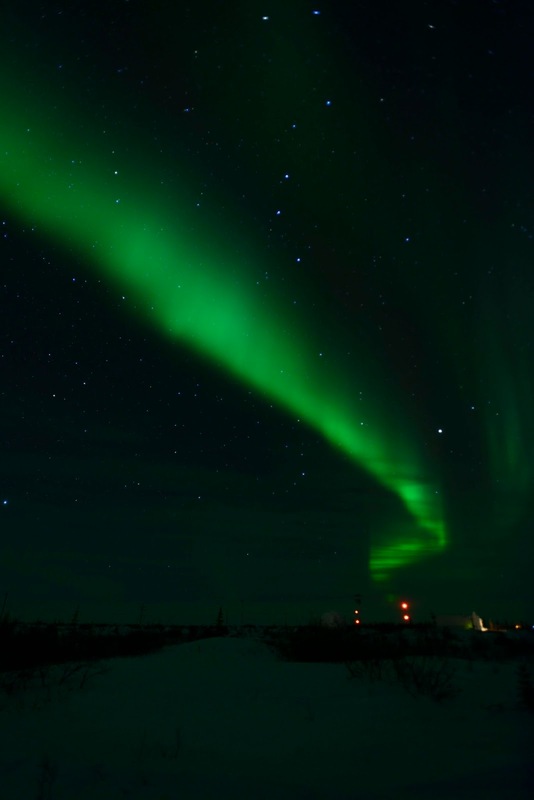 We left Churchill the evening of the fourth day and were treated to more northern lights as we awaited our plane. I stood in the airport parking lot, lit by sodium lamps, and once again saw splashes of color in the aurora. As an extra treat, we saw the aurora (back to silver) from the airplane as we flew to Winnipeg. My camera sees much better in low light than I do. Its cone-equivalents can gather light for twenty or twenty-five seconds before rendering an image. My eyes can’t accumulate light in the same fashion as they are required to report to my brain on a continual basis. Patience is indeed a virtue. Some nights the aurora did not start until quite late. Often the initial burst of aurora activity would die out, only to return much later with an even more brilliant display. Even though I had read a book on auroras and understood how and why they are created, I had not considered how my eyesight would affect what I would and would not see. I am a really, really lucky person. I appreciate that and do not want to forget it. P.S. 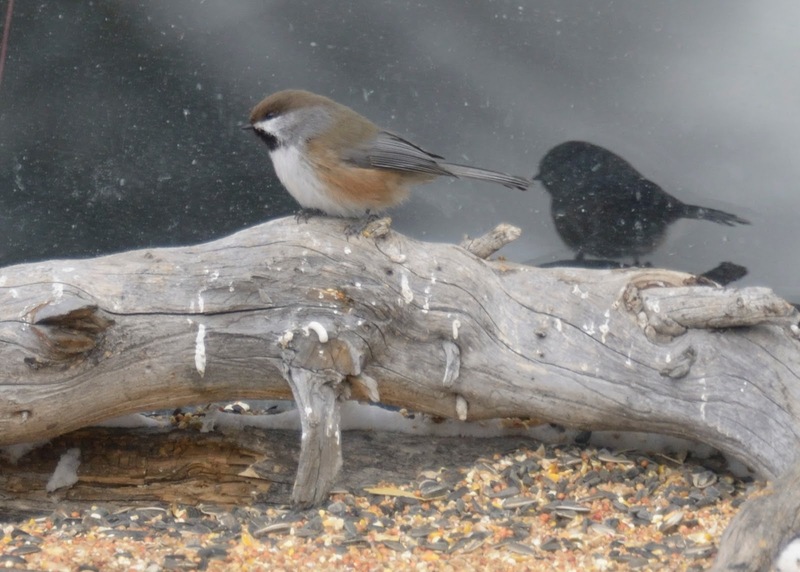 Here's a picture of a boreal chickadee and his reflection for those who might think I only looked skyward on this trip. Great post, Jim. The aurora is on my bucket list, and it makes sense to me now why I might not have seen a display by just looking out the window or running outside to check the sky. Thanks for the info, Jim! 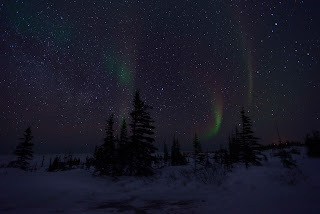 We've actually seen the northern lights a couple of times in the UP when we went light chasing. Both times we stopped taking photos waiting for it to get more spectacular. Now I know the camera might have captured the "more spectacular" occurrence our eyes were unable to see! Finding a spot along Lake Superior far enough away from city lights would make for excellent Northern Lights viewing.